The growing popularity of cell phones has made public telephones quite rare these days, and perhaps the day is coming when very few people will remember them at all, so perhaps a few reminiscences will be in order. When I was young, phone calls from a public phone booth cost a tickey. A tickey was the smallest coin, worth 3d before 1961, and 2 1/2c thereafter. In 1961 we switched to decimal currency, and a shilling, previously divided into 12 pence, was divided into 10 cents. As a rouch guide, you could say that money was then worth 100 times what it is worth today. One Rand today is worth about what one cent was worth in 1961. So, in todays terms, a phone call from a public phone booth cost about R2.50 in today’s money. Long-distance calls were more expensive, in both relative and absolute terms, than they are now, and you couldn’t make them by dialling from public phones — you’d have to ask the operator to connect you and deposit the requisite number of coins. Overseas calls were unthinkable. A call to Britain cost three pounds for three minutes. There were 80 tickeys in a pound, which meant that you would have to deposit 240 tickeys to make a 3-minute phone call. 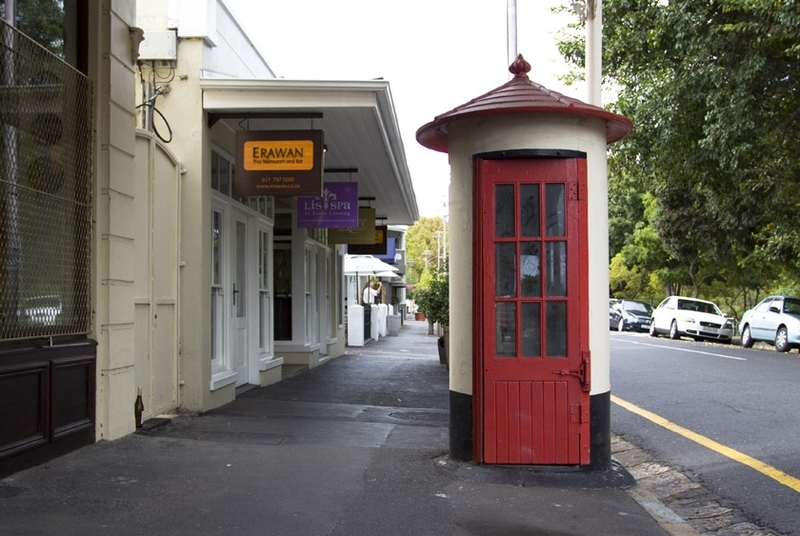 Back then public phone booths were cylindrical affairs that looked as if they were made from a concrete pipe, with a door and a conical roof, so it was difficult for people outside to see what was going on inside. Now that is the kind of picture where, if you see it on Facebook, people say “Click ‘like’ if you remember this”. You can click “like” if you like (see below), but it would be more fun if you actually shared some of your memories of these in the comments section. And a hat-tip to Paul Galowey of Cape Town Daily Photo for the picture. Those old phone booths are a rare sight nowadays, and I can’t remember when I last saw one. When I was young one of the advantages of the design was that it was hard for people outside to see what you were doing inside, and so it was easy to resort to various tricks to get free phone calls. In those days all the public phones used pulse dialling, and you could fool the phone by jiggling the handset rest at roughly the same speed that the numbers were dialled. So, if the number began with 32 you would go tap-tap-tap pause tap-tap, and so on. Another method of getting free calls was to use a “long tickey”. The “long tickey” was a piece of wire which you inserted in a hole in the handset, and earthed the other end, usually on the metal grille that covered the light, at the point at which you would have inserted the coin (when the other party answered). The tickey coin was abolished in 1965. In that year a new series of smaller coins were introduced, with the silver coins being replaced by nickel ones. The new 5c piece was a little bigger than the old tickey, and the public phone booths were converted to take those. I remember the first time we encountered one. I was travelling back to Pietermaritzburg from Grahamstown with some friends, and we needed to phone home for some reason, and we stopped in Ixopo to do so, at the post office, where there was a public telephone booth. But it only took the new coins, and we didn’t have any, and had never seen any. It was late, and the post office was closed, so we had to rush around the town looking for an open shop to find if they could give usb some in change. We dicovered that if you dropped the new coins they didn’t clink like real money, but clattered like plastic buttons. We were not impressed. Oh I remember those telephone boxes well, Steve. They didn’t always work perfectly, and many’s the tickey which was swallowed by the cursed machine without providing the luxury of a phone call. For a local call you dialled the number and then popped the coin into the slot when the person answered. That established the connection, and you had three minutes of talk time before the next tickey was demanded by a series of beeps. But for trunk calls, which had to be connected manually via the exchange, the operator told you how many coins had to be deposited, and then counted the number of noisy crunching sounds each coin made as it dropped through the slot. If you were really clever you could imitate that sound by earthing a piece of wire such as you described for your ‘long tickey’. The only problem was that if you weren’t good enough at your subterfuge, the operator would realise what you were doing and you’d be disconnected, never to be reconnected while that operator was on duty! Interesting how the terminology has entrenched itself, though. Even today I hear people who weren’t even born in pre-decimal days referring to a public call box as a ‘Tickey Box’. Yes, the “long tickey” worked best on local calls, when no operator was involved.